Find out everything you need to know on the new Jeep Grand Cherokee from independent vehicle review website Car And Driving. You can watch the video review to the left to see more of the car or read their written review below to get a true insight from an expert in the automotive industry. 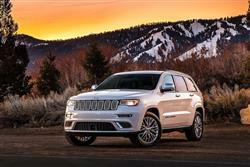 Jeep's Grand Cherokee has been usefully updated, adapting itself smartly to a changing market. Jonathan Crouch takes a look. You'd like a Jeep Grand Cherokee; the surveys certainly seem to bear that out, one recently voting it one of the 'Top 10 best cars to own in the UK'. This revised version gets electric power steering with selectable modes, a little extra electronic safety prowess and a slightly nicer interior. Otherwise, it's much as before, so it's big, plush and practical and the 4x4 underpinnings are still as tough as ever. Economy and emissions have improved but lag behind the class best. Jeep has come a long way in a short time. It's a company with over seventy years of history behind it, but for many, Jeep's Year Zero was 2009, when the company filed for bankruptcy. Since then, it has emerged like a muddy phoenix from the ashes, and sales have doubled worldwide. Part of that has been due to customer confidence from the takeover of the Chrysler Group by Fiat, the rest has been down to improved products being sold at competitive pricing. That part's hardly rocket science. The latest Jeep Grand Cherokee continues that trend. Although the true bloodline of Jeep is best expressed through its Wrangler models, the Grand Cherokee is the big money spinner and the company's success or failure hinges on this product line more than any other. In short, it's a car that it can't afford to get wrong. With no little pressure to succeed, Jeep has continued to improve this latest Grand Cherokee. The 3.0 CRD badge you'll see on the back of most Grand Cherokees would suggest that the Jeep has that redoubtable Mercedes-derived engine under its bonnet, but instead it's a unit built by Fiat in collaboration with VM Motori which generates a maximum power of 250PS and torque of 570Nm, which is right in the sweet spot for a vehicle of this size and weight. A slick ZF eight-speed automatic gearbox is standard across the range, helping efficiency and response. At typical motorway speeds, the Grand Cherokee will typically be registering around 1,800rpm. If all of this sounds a bit worthy, you could instead opt for the Grand Cherokee SRT. This gets a 6.4-litre V8 engine good for 468PS and is capable of accelerating to 62mph in just 5.0 seconds. Believe it or not, but this behemoth actually handles as well. The key change made to this improved model comes with the addition of an electric power steering. You can alter the feel of this set-up via selectable drive modes (Sport, Comfort or Normal). Off-road, the Grand Cherokee is as tough as ever. A low-range transfer box makes light work of serious mud plugging and a set of diff locks mean that owners will be kept moving where most rivals would find themselves at a momentary traction deficit. Most models come with steel sprung suspension, but to experience the Grand Cherokee at its best, you really need the air suspension that's standard on models from the Overland up. The styling updates made to this model back in 2014 gave it a lot more streetside presence and Jeep has wisely not tampered with these, deciding only to give this updated version a wider palate of colours. It's still instantly recognisable as a Jeep, but these days this car now has far more of a contemporary look with smaller, meaner HID bi-xenon headlights leading off what the stylists hope is a more muscular, athletic look emphasised by a steeply raked windscreen and high waist line. Inside, the dash is much as before, with an intuitive design to the control layout, the centre console dominated by a touch screen developed by stereo specialists Harman Kardon. Like high-end Jaguar and Mercedes models, the main dial pack features a TFT screen which can be configured to show an 'analogue' or digital speedo, as well as sat-nav instructions or details of the drive logic of the 4x4 system. Detail changes include the addition of a smarter, more substantial premium gear lever to replaces the old aircraft-style e-shifter, plus there are detail revisions to the centre stack that include Sport and Start/Stop buttons. Space isn't bad, but there's no seven seat option which will strike it from the lists of some, although the 782-litre boot is reasonably good. Rear headroom is acceptable, although foot space is a bit pinched if you have tall front seat occupants. There's an automated tailgate that, like most examples of its ilk, is maddeningly slow. If you've followed the story of the Grand Cherokee down the years, you'll have noticed some ups and downs. The car was originally positioned as a rival for the likes of Range Rover and was priced accordingly. When models like the Mercedes M-Class and BMW X5 appeared, the SUV sector shot into a different league, one where Jeep appeared to have been left behind. Hindsight shows that perhaps the US brand was playing a smart card, understanding its core buyers and aware of the limits of its brand equity. With compact SUVs now routinely topping £30,000, the Grand Cherokee has come to represent excellent value for money, costing from around £45,000. These days this Jeep looks a competitively-priced rival to the Volkswagen Touareg and offers a much cheaper alternative to the likes of a Mercedes GLE or BMW X5. UK buyers get to choose between three trim levels - Limited Plus, Overland and Summit. All models come as standard with dual-zone climate control, automatic wipers, USB and auxiliary inputs, and roof rails. Go for the Limited and you get front and rear parking sensors, a rear-view camera, leather upholstery, a powered tailgate, electrically adjustable and heated front seats and a stereo upgrade. Limited Plus adds satellite navigation and 20-inch alloy wheels. The Overland model will prove popular, with a panoramic sunroof, blind-sport monitor and adaptive cruise control with forward collision detection. Opt for the range-topping Summit and you'll enjoy a 19(! )-speaker Harman Kardon stereo, along with various trim finish upgrades. A key safety improvement is the 'Stop' function that works up to 7mph as part of the 'Rear Park Assist' system, plus a full speed forward collision warning set-up is now included for the first time. The economy and emissions figures of the diesel Grand Cherokee could best be described as respectable. The 40.4mpg average figure for the 250PS model is a few miles per gallon shy of its best German rivals and the 184g/km of carbon dioxide it emits is around 20 per cent worse than some of the more efficient diesel engines in the class. The eight-speed automatic gearbox introduced n 2014 has helped here but it can only do so much. So a little off the pace? Let's look at those figures in a little more detail. Yes, a Mercedes GLE 250d might get 45mpg and emit just 165g/km but with that car you're paying a whole heap more and getting an engine that makes just 206PS. So with the Jeep, you're getting a little less economy but more power. It sounds like a reasonable trade off to me. Reasonable isn't a word that applies too strongly to the SRT model. With 468PS on tap it was never going to be something a Prius owner would look to graduate to and the claimed 20.9mpg and 315g/km of CO2 seems comically optimistic in real world conditions. Let's file this one under 'Heading In The Right Direction'. Of course there will be those who won't accept anything other than a Land Rover, Mercedes, Porsche, BMW or Audi luxury SUV and will be willing to pay for the privilege. To these buyers, the Grand Cherokee may still feel lacking somewhat in sophistication. To judge it on the strength of superficialities is to sell this vehicle a long way short though. The Grand Cherokee remains long on substance, with serious off-road ability. Even if you don't care about grazing your sump once in a while, consider the on-road performance and equipment you're getting for your pound. It's hard to argue against. Jeep has largely left alone the things that were fundamentally right, such as the engines and running gear, and has diverted attention to those areas where the Grand Cherokee was left looking dated, namely the interior finish. In that respect, this update is both sensible and effective. It deserves to do well. Judging by Jeep's happy-looking sales charts, you certainly wouldn't bet against it.